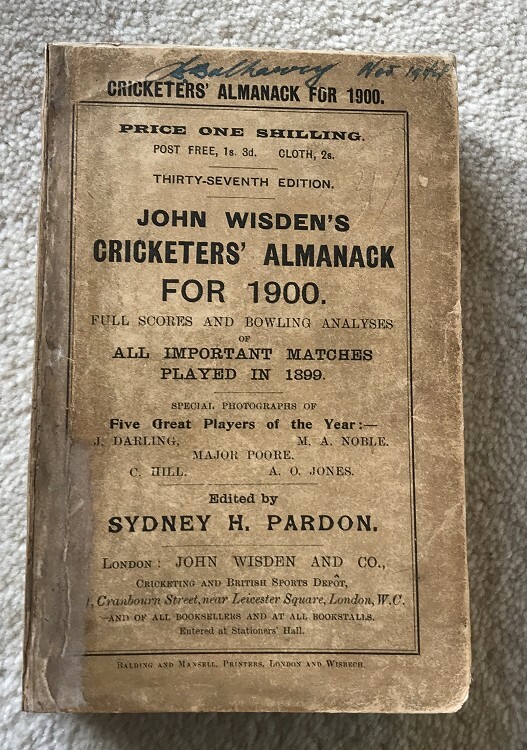 This lot is an Original 1900 Wisden Paperback with facsimile spine. This is in Good to Very Good condition. The covers are nice and tall with minimal marks. Name to the top of the front cover. Wear close to the spine but nice covers overall. A nice new spine with text has been added , it is neat and tidy but not an exact copy of an original Wisden. Internally very nice indeed , there is clear tape to the hinges but it is tightly bound with an excellent photoplate. New spine professionally added which makes the book readable and stops it falling apart. Postage: £4.90 which covers First Class Delivery & Jiffy Bag to UK else £10ish.